Along Corso Cavallotti is villa Nobel, a Moorish eighteenth-century building typically decorated in Venetian Renaissance style. Villa Nobel, built in 1874 and restored in 1892, is placed in the middle of a wonderful park, and is property of the District of Imperia, which subsidized in 1993 its current restoration. The villa owes its name to the famous Swedish scientist and inventor of dynamite, Alfred Nobel. After having inhabited it for 6 years (from 1890 until 1896), he defined it “my nest”. In this house, Nobel worked on many of his patents and composed the famous testament, according to which a prize, be it ethic, moral, or economic, should be conferred to anyone who contributes to human welfare, hence known as the Nobel Prize. The park around the house, which once stretched up to the sea, includes several rare tree-species, among which the tall “Cupressus macrocarpa”, a Californian species. At its roots has been placed a Bofors cannon, dating back to 1883, that Nobel used during his experiments on weapons’ range. The interior of Villa Nobel is developed on three floors. In the basement is Nobel’s laboratory containing pictures giving a historical and technical description of the main experiments. The ground floor houses a conference room decorated by Pompeian frescos. The scientist’s studio is on the first floor. 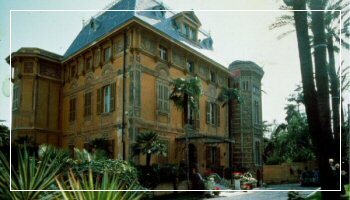 In San Remo, but particularly in this villa, Nobel found the ideal atmosphere to study and research. He first came to San Remo in 1890, but the notary Balestrieri convinced him to sign up the purchase contract of the once called “Villa Patrone” only as late as 25th April 1891. Beside the clear adherence to artistic rules which dominate the architecture of the building, the well-structured gardens and wells, the scientist was particularly struck by the slender and elegant lines of the construction. The researcher was an intensively private individual, rarely seen by the inhabitants of San Remo. He preferred to spend his days on his books, even though his studies were often interrupted by the frequent crises caused by his illness.